Really cool! Sent it straight to the funeral home. Was kind of behind, and heard about it last minute, and they did same day delivery! No problems for us. Flowers came in just like the picture. We have never used the Tribute Store before, but the family really seemed to like the flowers. will have to rememeber this site! A really perfect basket. Simple, classic, and lovely. Never saw the basket but our friends down in Missouri sent us a pic and told us how pretty they were. Works for us! A very beautiful arrangement. Just what we were looking for. Speaks volumes to those who need sympathy. So it was our first ime trying to order from here. Never know what you might get right? But we have zero complaints. The customer service was excellent. Flowers came on time. They looked just like how it was pictured. We had a really good experience. Easy easy easy. If you are looking for no hassle online flower order, you've come to the right place my friend. A very beautiful basket indeed! We were very happy with what we got. Looked really good when we arrived to the visitation. We loved it! It wasn't anything flashy or fancy, just a nice thoughtful simple tribute. Very happy with the order/delivery! Easy and fast. Thanks again! Awesome! Thank you, the cs rep was very thoughtful. Very moving arrangement. 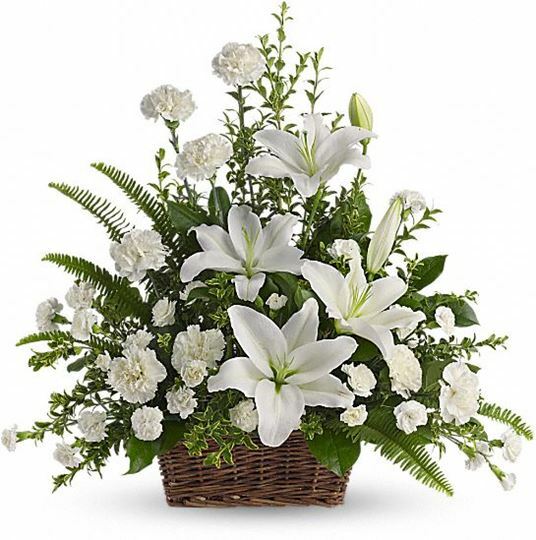 Says so much with beautiful white lilies. Im happy we settled on it. Our friend's grandmother really appreciated it! thank you! Looked good and smelled lovely. Simple and sweet! It came looking just like the picture, with very fresh lilies. Thank you!